Chelsea's Jose Mourinho insists rival managers Sir Alex Ferguson and Arsene Wenger are good friends despite their bitter Premiership rivalry. 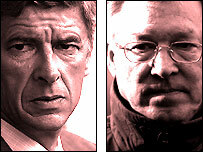 Manchester United boss Ferguson and his Arsenal counterpart Wenger have clashed on a regular basis in recent years. But Mourinho said: "I've been to the Uefa meetings for the last three or four years and have met them both. "We all know each other but they have a very good relationship and respect each other. They are good friends." Ferguson's latest verbal attack on Wenger came in the build-up to Sunday's Premiership meeting between the sides. The United manager said Arsenal should have been punished more heavily after last year's stormy clash at Old Trafford. Mourinho, however, said the pair enjoyed a much warmer relationship away from the heat of battle. "They have dined at the same table and spoken about football," the Chelsea manager added. "In the last two years at these meetings I have been in the same group as them and they have talked about football and shared their opinions. "But when the big game arrives one of them is the boss of his ship and vice-versa. "I enjoy the mind games but after my Porto team played United last season, Alex was in our dressing room after the game. "And when we played them at Stamford Bridge this season, he was in my office afterwards. "I think managers want to try and influence their players with motivation and courage before a game. "But form means nothing in these big matches when you look at all the quality players on both sides." Arsenal will win tomorrow for the simple fact that they are too good! Mourinho believes defeat for United on Sunday would knock them out of the title race. "If Manchester United fail, they will be too far out of the fight. It will be over," he said. "If Arsenal lose then it will also be their first test psychologically. "Arsenal will be 14 points ahead of United by winning and, providing we beat Blackburn, they [United] will also be nine behind us. "That would make it very difficult for them and they know it. That is why I think they won't lose."